A 1929 Bentley 4½-litre Tourer is the lead car for the Bonhams Goodwood Members’ Meeting 2019 classic car auction. 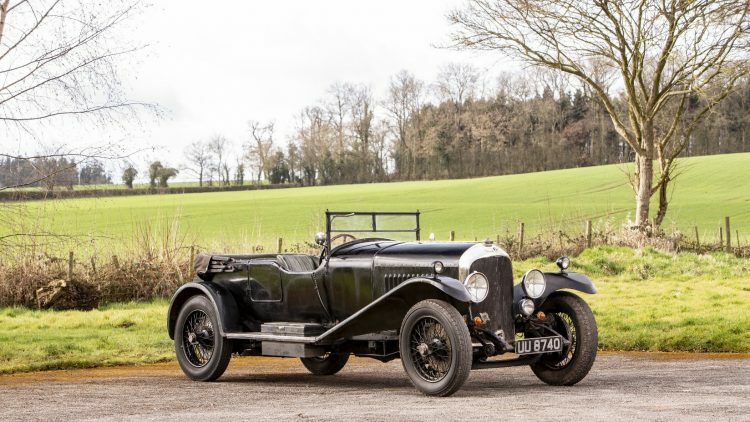 Bonhams is offering an extraordinarily well preserved 1929 Bentley 4½-litre Tourer, with an estimate of £600,000-800,000, as the lead car for the Goodwood Members’ Meeting sale on Sunday 7 April 2019. Bonhams scheduled the Goodwood Members’ Meeting 2019 sale on Sunday 7 April 2019. This is the 77th Members’ Meeting to take place at the historic Chichester estate. The Members’ Meeting sale is the smallest of the three annual auctions Bonhams currently arranges in coordination with Goodwood. The more important auction is during the Goodwood Festival of Speed – for 2019 a highlight at that auction will be the 1992 Williams-Renault Formula 1 car driven by Nigel Mansell to five Grand Prix victories. An extraordinarily well preserved 1929 Bentley 4½-litre Tourer, estimate £600,000-800,000 ($755,000 – $1,000,000), is the lead car for the Bonhams Goodwood Members’ Meeting 2019 classic car auction. this Bentley has been in single-family ownership for the previous 80 years. This outstandingly well-documented motor car retains its original chassis, engine, gearbox and, most importantly, Vanden Plas coachwork – unusual for a surviving Cricklewood Bentley. All these have been authenticated by marque authority Dr Clare Hay, making it a correct, matching numbers 4½-litre. It is offered with its original sales brochure and handbook. The Bentley was first ordered by Jack Barclay Ltd in 1929, and sent to Vanden Plas to be fitted with the current sports four-seater body. Yet only six months after this, its first owner Major C L Y Parker had it upgraded with the ‘Le Mans conversion’ by Bentley Motors – who were then at the top of their game after five Le Mans wins in seven years – which dramatically improved its performance. This distinguished motor car has since enjoyed more than 80 years of single-family ownership, which accounts for its remarkable number of original parts. The late vendor’s uncle, Alistair Maclennan, bought it in 1939, and during his WWII service in the Royal Artillery put it to good use towing Bofor guns – a testament to the machine’s power and endurance. The car has been in regular use since. The Members’ Meeting sale will see a marvellous range of historic motor cars crossing the rostrum, including a 1964 Aston Martin DB5 Sports Saloon (£580,000-660,000), a 1968 Aston Martin DB6 Volante (£480,000-580,000), a1967 Maserati 3.7-Litre Mistral Spyder (£350,000-450,000) and a 1974 Ferrari 365 GT4 Berlinetta Boxer, delivered new to Sir Elton John (£250,000-300,000).